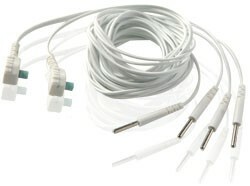 A replacement set of earclip electrodes for application of CES with the Alpha-Stim® 100 or Alpha-Stim® SCS. 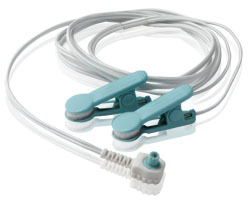 Requires self-adhesive felt electrode pads (item #EEP) and Alpha Conducting Solution™ (item #ACS). Models 100 and SCS only. 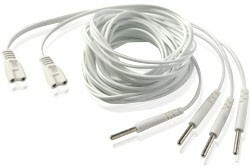 To prevent wire breakage, do not wrap earclips or leads around your Alpha-Stim device. Store all wires loosely packed in the protective case. Always remove earclips from your ear lobes by pinching the clips.